Following the success of last year’s ‘Pre-Christmas Bodega Sale,’ Paref Woodrose is opening it’s doors once again and inviting everyone to do their early christmas shopping here. This year’s Pre-Christmas Bodega Sale promises to be more exciting with new additions on the list of product line ups available on sale. Aside from the usual apparels, accessories, and linens, shoppers can also score great deals on kitchenwares, glasswares, hotel-restaurant equipments and many more. Paticipating merchants include popular brands such as 101 New York, XOXO, Toy Kingdom, Imarflex, Claire’s, Popstar, and Krispy Kreme, among others. The Pre-Christmas Bodega Sale will be from November 13 to 16, 2013 (Wednesday to Saturday) at the Woodrose Promenade. This is a fundraising project for the benefit of the Friends of Woodrose Scholarship Program. 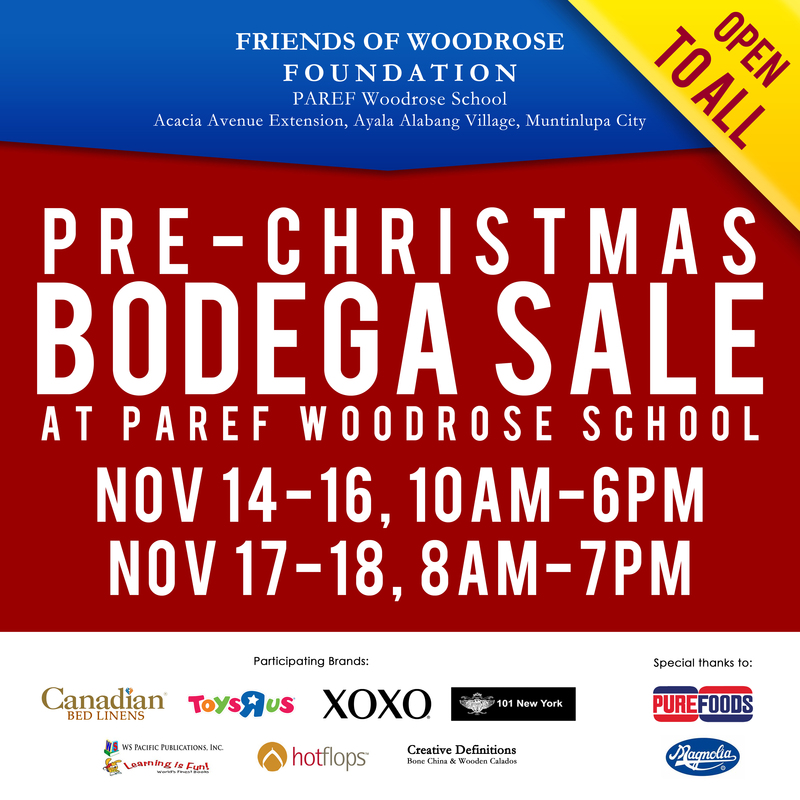 Don’t forget to check out Friends of Woodrose Foundation’s Pre-Christmas Bodega Sale next week at Paref Woodrose School, Alabang especially if you are within the area. Get a chance to score great deals from international brands like XOXO, 101 New York and many more! This Pre-Christmas Bodega Sale is for the benefit of the Friends of Woodrose Foundation’ scholarship fund. See you there! So have you started shopping for Christmas? This is that time of the year when we troop to different malls, outlet stores, and bazaars and shop to our hearts content. I am sure by this time, you have already marked the red letter dates in your calendar. Well for people living in the south, you have another set of dates to mark as Paref Woodorose School is opening its door to early christmas shoppers this Nov. 14-18. The Friends of Woodrose Foundation has organized a Pre-Christmas Bodega Sale where you can score great deals from international brands like Canadian Linens, XOXO, 101 New York, Toys R Us and many more. So before hitting the mall or checking out different bazaars do drop by the Friends of Woodose Bodega Sale first. Not only will you satisfy the inner shopping goddess inside you but you will also able to help fulfill the FOW’s mission of providing scholarships to bright and promising young girls. 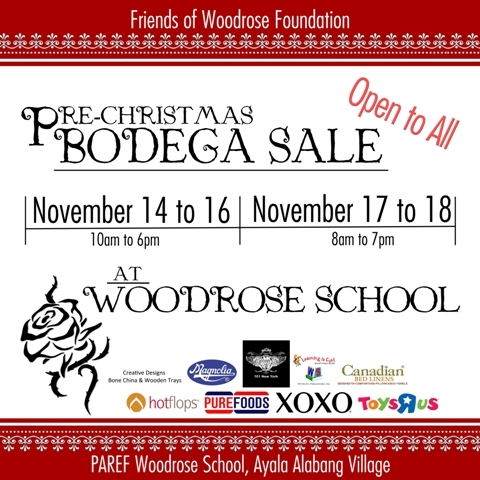 For more updates regarding the much awaited Friends of Woodrose Pre-Christmas Bodega sale, check out Paref Woodrose School’s official website here.